As I was rummaging through my pantry to gather all of my flours for this series, I came across a bag of garbanzo bean (a.k.a., chickpea) flour. It took me a minute, but then I remembered why I purchased it initially. It was to try and recreate one of Chelsea’s favorite vegan snacks – chickpea fries. I think I tried two recipes – both failures – before closing up the bag and shoving it into the back of my pantry. But I was determined to get it right this time, and sat down to do another search. And I came across a recipe from one of my favorite food blogs, the view from great island. I love this blog, and encourage you to take a look if you’ve never read it. In addition to beautiful photography, Sue offers up tasty and accessible recipes – all of which you will want to make as soon as you see them. More importantly, her recipes WORK. Too often I have amassed my ingredients, printed out my instructions, and spent time and effort creating a dish or snack that doesn’t work. And unfortunately it’s because – too often – the recipe itself is flawed. But this blog delivers success each and every time, so I knew I’d found “the one” for creating perfect chickpea fries. Crisp on the outside with a fluffy interior, and a shape that stayed intact upon frying. 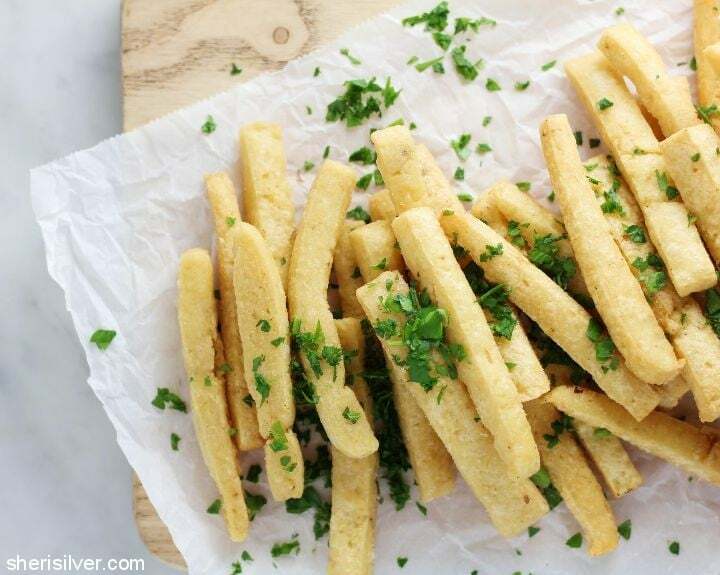 These were actually easier to make than traditional french fries, and so much healthier too. Chickpeas are high in fiber, protein and other nutrients. Line two 8″ x 8″ pans with parchment paper on both sides to create a “sling”. Whisk together the flour and spices. Bring the water and olive oil to a boil in a medium saucepan. Lower the heat and gradually whisk in the garbanzo bean flour, stirring till the mixture is thick and smooth. Divide the mixture evenly between the two pans, and smooth with a small offset spatula. Top with another piece of parchment and continue to smooth out the top. Refrigerate for at least one hour, or till fully set. Heat 1 – 2″ of vegetable oil in a large pot, to a temperature of 350 – 360 degrees. While the oil is heating lift out the chilled dough, transfer to a cutting board and cut into 4″ x 1/4″ strips. Fry the strips in the oil – a few at a time – till golden brown. Use a slotted spoon to transfer to a paper towel-lined tray to drain. Season with sea salt and parsley; serve immediately. Take a look at my Pinterest board for more wheat-free recipes! Can the oil be left out or substituted with a different for of binder? 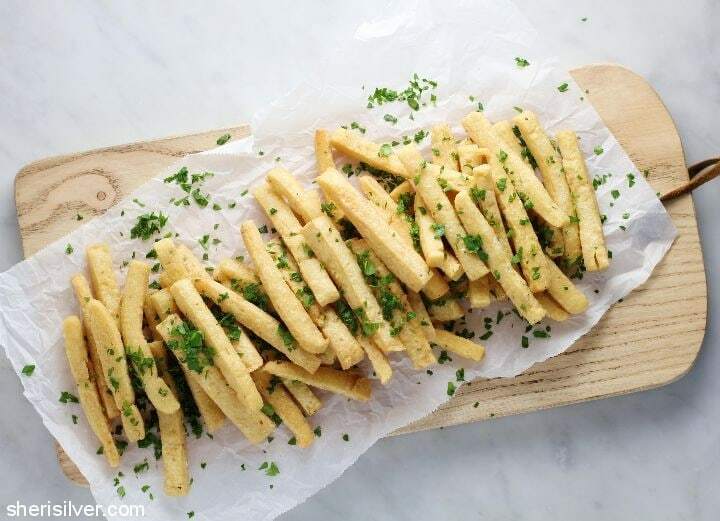 Can the fries be baked instead of fried?